Surface resistivity is the resistance to leakage current along the surface of an insulating material. Volume resistivity is the resistance to leakage current through the body of an insulating material. The higher the surface/volume resistivity, the lower the leakage current and the less conductive the material is. A standard size specimen is placed between two electrodes. 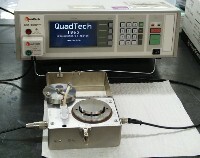 For sixty seconds, a voltage is applied and the resistance is measured. 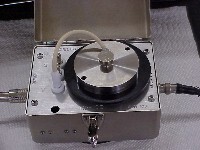 Surface or volume resistivity is calculated, and apparent value is given (60 seconds electrification time). A 4-inch disk is preferable, but may be any practical form, such as flat plates, rods or tubes for insulation resistance. Surface and Volume resistivity are calculated.